On April 20, 2010, at the meeting of the Board of Directors of the East Bay Regional Park District (EBRPD), the District’s “Wildfire Hazard Reduction and Resource Management Plan” was approved. Nearly half of the speakers were critical of the Plan and asked for a variety of revisions to address their concerns. The most frequent criticism was that the implementation of the Plan would require increased use of herbicides to prevent the regeneration of the eucalypts proposed for removal. This criticism prompted supporters of the Plan to say that eucalypts cannot be killed without using herbicides. We believe it is true that many non-native plants and trees cannot be eradicated without the use of herbicides. The use of herbicides in projects called “restorations” strikes us as ironic. In what sense is the land “restored” which has been doused with herbicides? How does a project that is dependent upon herbicides manage to bill itself as being beneficial to the environment? Eucalypts resprout from their roots when they are destroyed for any reason. If they burn in a fire, die back in a freeze, or are cut down, they will resprout unless they are poisoned. The stumps must be sprayed within minutes of being cut so that the poison is absorbed into the roots of the tree. The herbicide being used presently for this purpose is Garlon with the active ingredient triclopyr. 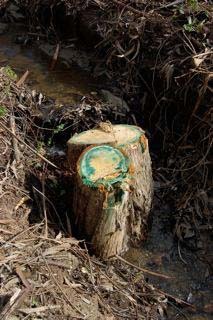 Those who are responsible for application of the herbicide claim it is “painted” on the stumps, implying that this method of application eliminates drift of the herbicide into air and soil. This description of the application method is contradicted by the manufacturer of the herbicide, DowAgra. The manufacturer describes the method of application: “Treat the exposed cambium area and the root collar (exposed bark on the side of the stump) down to the soil line. Be sure to treat the entire circumference of the tree. To ensure effective control on large trees, also treat any exposed roots (knees) that surround the stump.” This method is illustrated on the manufacturer’s website by a person holding a spray applicator. The author of this letter estimates that the cost of these repeated applications of herbicide will be $273,410 to prevent regeneration of eucalypts on only 111 acres. However, cost is not our primary concern on Million Trees. Our concern is that the eradication of nearly a half million eucalypts on the properties of UC Berkeley, East Bay Regional Park District, and City of Oakland will require a great deal of toxic herbicide to accomplish. What do we know about Garlon (triclopyr)? Nearly two years after this risk assessment was completed, Marin Municipal Water District has confirmed in writing that they are not presently using herbicides on MMWD properties. Update: In 2015, MMWD made a permanent commitment to NOT using any pesticides on their properties. Read about why they made that commitment HERE. The East Bay Regional Park District used 191 gallons of herbicides in 2008 according to its official Integrated Pest Management Report (IPM). Its use of Garlon has increased 325% from 2003 to 2008. 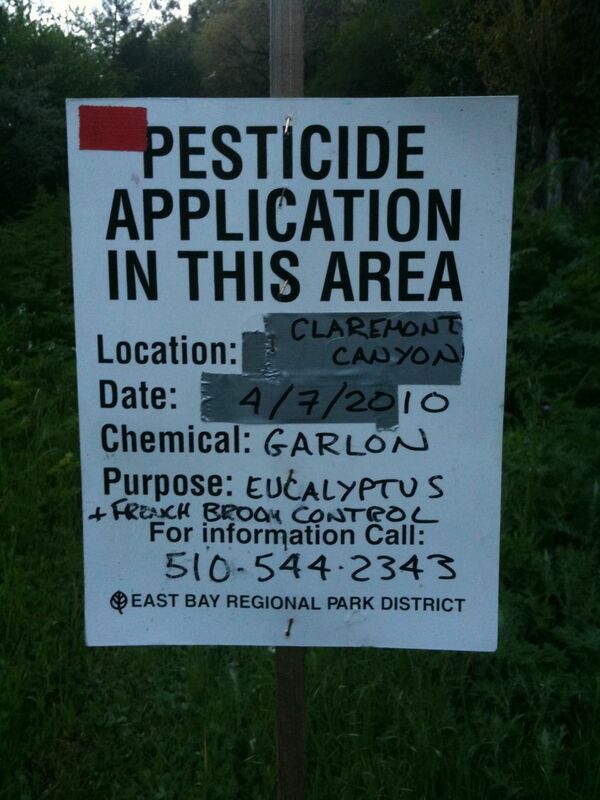 Now EBRPD proposes to remove nearly one million eucalypts, which will require a huge increase in its use of Garlon. More articles about herbicides and pesticides are available HERE. Please email me if you or your readership would like an article about the agencies (USFS, NPS, state forestry commissions, etc.) in the Southeast, USFS Region 8, and their “invasive wars”. Not that the routine use of herbicides in the course of commercial forestry management isn’t bad enough around here, but the NNIS pesticide use is going over the top. More frightening is the widespread use of the new systemic poisons, like the neonicotinoids. These poisons, such as Imidacloprid, and clothiandin, now under an EPA comment period to decide if they should review it’s registration, are the main cause of pollinator die-offs and colony collapse among bees. They are banned in many countries, but sold in our hardware stores to anyone, just like RoundUp. These insecticide soil soaks and soil injections are going on all over to save chosen species (hemlocks, ash, etc.) from “invasive” bugs. Soak the soil, make the whole living tree toxic, including pollen, never mind that these dare necessarily highly soluble and mobile toxics and they cause irreversible nerve damage even with trace exposures. It’s akin to poisoning prairie dogs or coyotes, happening in every watershed, with no regard for downstream or food cycle consequences. The USFS used over $140,000 of stimulus money for herbicide applications (as part of NNIS exterminations) on the Chattahoochee National Forest last year, including the headwaters of the Chattahoochee RIver, the smallest watershed serving the greatest number of people in North America. Millions will be drinking the trace residuals. HTe USFS has added time release tablets (BAyer’s CoreTect) to the forest treatment regimen, so reservoirs of poison will be melting into our regions soil and water for a long time. …Outbreaks of infectious diseases in honey bees, fish, amphibians, bats and birds in the past two decades have coincided with the increasing use of systemic insecticides, notably the neonicotinoids and fipronil. A link between insecticides and such diseases is hypothesised. Firstly, the disease outbreaks started in countries and regions where systemic insecticides were used for the first time, and later they spread to other countries. Secondly, recent evidence of immune suppression in bees and fish caused by neonicotinoids has provided an important clue to understand the sub-lethal impact of these insecticides not only on these organisms, but probably on other wildlife affected by emerging infectious diseases. While this is occurring, environmental authorities in developed countries ignore the calls of apiarists (who are most affected) and do not target neonicotinoids in their regular monitoring schedules. Equally, scientists looking for answers to the problem are unaware of the new threat that systemic insecticides have introduced in terrestrial and aquatic ecosystems. Immune suppression by neonicotinoid insecticides at the root of global wildlife declines. Journal of Environmental Immunology and Toxicology (in press). Webmaster: Thank you for your visit and for you informative comment. We will be in touch with you about writing an article for Million Trees. We can turn this around if we work together to inform the public of the destructive actions being taken in our public lands. No date on your post, but the comment above is from 2012. South Africa uses Garlon on invasive Australian aliens, and we used it unwillingly on invasive alien trees in our garden. Put “herbicides”into the search box on this site or click on that category to see many new posts on that subject. When I was 17 I was working with the DNR in Washington state doing hack and squirt for 3 months with wet gloves from dripping spray bottles. At the end of a work day tobacco tasted too sweet to smoke. Just wondering if that is the reason I’m sterile.